Yellow pages? No. YellowPages.com? Yes. Right out of college I had a job working for a directory publisher. We compiled a massive list of periodicals, published a HUGE directory in hard cover book form once a year, and sold it to libraries. Oh, the trees! Sounds kind of quaint now, doesn’t it? Updating critical information about key industry players once a YEAR? Actually, it now sounds kind of stupid. Not that it was stupid then, but using the dead-tree format now would certainly be pretty stupid. Our world is always on, always current. It makes much more sense, or at least provides much more utility, to have an online directory, accessible everywhere, and kept up-to-date in real time. That’s the world we’re in. As we discussed last month, our current world, though perhaps more global than ever, still has in many respects an intensely local flavor. People still live in a community (even if it’s a metropolis). People still work, eat, shop and hang out primarily where they live. If your local establishments are like ours, they may even emphasize a hyper-local attitude. Our local grocery exhorts us to “eat, live buy local”. 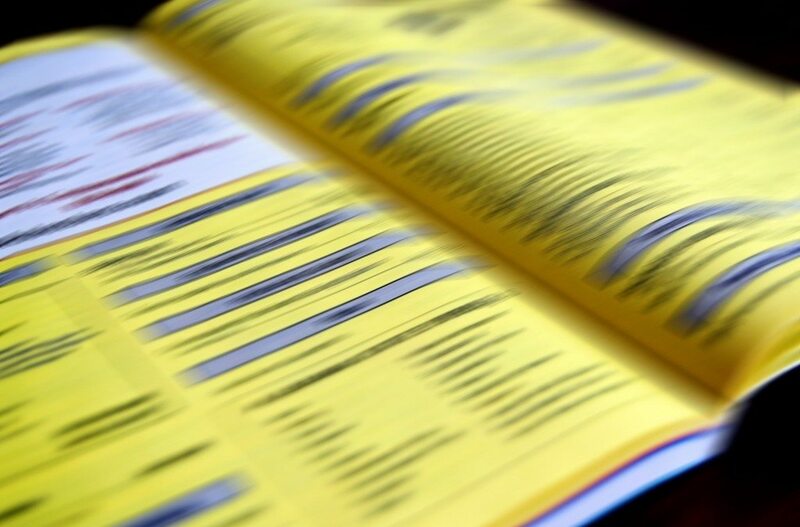 Do you still receive a yellow pages directory? If so, do you do anything but toss it immediately? If you don’t toss it, do you look to it for local business more than you look to your phone or computer? (If you’re in the “yes, yes, yes” category, you can probably stop reading here.) Now that paperbound directories are largely extinct, how do we let people in our locale know our business or enterprise exists? Answer: Through the use of online business directories. Google My Business. Look for Google My Business (the service name has changed a lot over time) and/or Google+. Create a page for your business. Brand it. Post audio, video, links, pictures and the rest.Get reviews there. Why do we care? Because it is tightly integrated with other Google services and Google owns search. Owns it. Maybe not forever, but it does now. Bing Places for Business. Don’t forget about Bing. Not nearly as important as Google, it still gets 150 million unique visitors a month, many of whom are searching for local businesses. It’s linked to Yahoo as a bonus. Facebook Business Page. What? Facebook is an online business directory? Yes it is. A huge one. Make sure your business has a page, and that it is distinct from your personal page. Linkedin.com. Make sure you have a page setup for your business. This is where business people go to find out information about businesses. Yelp.com. Incredibly important site for reviews. We’ve mentioned this before: ask your customers for reviews. Ask them to post on trusted third party sites like Google+ or Yelp. Foursquare.com. Its 4 million monthly unique visitors pale in comparison to Yelp’s 30 million, but it’s a site at which people still share info about visits to local vendors. Make it easy for people to share information about the great product or service they got from you. Yellowpages.com and Superpages.com. YP gets about 30 million visits a month; superpages about 7 million. People still associate these names with directories. Manta.com and merchantcircle.com. Together these sites get about 9-10 million unique visitors a month. Every person has their particular favorite search service. For some, it’s these smaller sites. Angieslist.com (if available to your industry). This is THE place, in some industries, for vendor reviews. It gets 4-5 million unique visitors every month. Stats on visits are from compete.com. And these “general” or horizontal business directories are to be distinguished from vertical or industry-specific ones (that you should also get listed on). Now go get found locally! Did we miss an online business directory that you think is mission critical? Let us know about it in the comments section below. Image source: Obsolete Book – 5/365 by Jamie on Flickr. Used with Creative Commons license. Use does not connote endorsement.